When new users are created in Office 365, they receive their own OneDrive for Business library for storing and sharing documents. 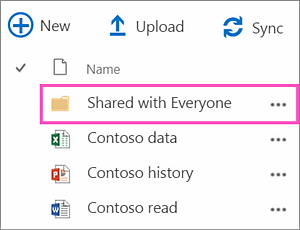 In that library is a "Shared with Everyone” folder that is shared with the entire organization except for outside users. To the user, it’s like a public folder that everyone in the organization can see. It looks like this in OneDrive for Business. To learn more about Windows PowerShell cmdlets in SharePoint Online, see Introduction to the SharePoint Online Management Shell.